Today is All Saints Day. It is a feast day to celebrate all of the saints who don’t have their own feast days. 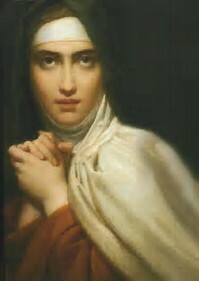 When I was confirmed, I chose St. Teresa of Avila to be my patron saint. She lived in Spain during the Spanish Inquisition. She was very spiritual as a child. In her early teens, she lost her mother. Her father was very strict and when Teresa began choosing a more worldly life, he sent her to a convent school. At school Teresa began to follow a spiritual life again and became a Carmelite nun. Shortly after that, she became very ill and experienced intense pain. In order to bear the burden of pain, she surrendered completely to God. Teresa’s prayer experiences were so intense that at times her body would spontaneously levitate. Not wanting a public display, she would have other nuns sit on her so she wouldn’t float away. Believing that being a Carmelite did not allow her to develop the prayer life she desired, Teresa founded her own order. She traveled all over Spain, setting up convents. She died at the age of 67. Teresa was a writer and poet. The following is one of her poems.